We’ve reached the halfway point of the season, and things are looking grim. Alice isn’t reacting well to Julia’s magic, Elliot and Margo are up to their necks in Faeries, Kady is institutionalized, Penny is still dead (or just Astral, depending on your point of view) and Dean Fogg is super cranky. Quentin and company, hearing Penny’s Big Mouth Billy Bass distress call, find Alice unconscious on the floor and render aid. Alice is okay for now, and claims that her body is just adjusting to the new magic. Dean Fogg says it is more likely that she is rejecting it like an incompatible organ transplant, but she appears stable enough for now. In an effort to control her symptoms and perhaps find a way to gain control of the power residing inside her, she goes to the Brakebills medical suites, where she is caught raiding the place by Professor Lipson, who is there to raid the place; Magic may be gone, but the black market is still buying. ...and makes a few suggestions before going on her way, but not before mentioning that she considered becoming a werewolf to regain magic, as magical creatures keep their innate powers. At Irene’s place, they gain a vial of white powder, the dried secretions of a rare magical creature, and the Dean immediately senses something amiss- he thought the McAllistair family reserves were batteries. Irene makes a deal with Julia to “owe her a favor” in exchange for the magic powder. Julia snorts it and feels the power is different, but it functions well enough and enables her to cast a tracking spell and find Alice, who has gone missing. Julia finds Alice, about to trade some cash for a vampire bite, and scares off the bloodsucker. Alice, in full junkie rage, lashes out at Julia with her own magic and slams her into a wall, knocking her out. Julia awakes back at home, next to the transference apparatus, and Alice, horrified at what she has become, tells her she gave it all back. Julia is happy that Alice will be safe, but is still disappointed that she has Reynard’s energy inside her. Alice tells her it isn’t his anymore- she felt it herself, and it is Julia’s now. Quentin, Poppy, Penny and Kady. Quentin, believing the key he lost to the Dragon in the Abyss went to the Underworld(along with dear Benedict), uses the Truth Key(#2) to ask Penny, the only dead guy he knows, to retrieve it. Penny insists he isn’t dead, but Quentin points out that his corpse is ash, so maybe Penny is in denial about his condition. Quentin doesn’t like having to beg Penny for help, but they eventually get on the same page. Penny, wanting to help, doesn’t have the ability to get to the Underworld, but Poppy has an idea. She overheard Quentin’s half of the conversation, and when they hit a dead end on passages to the Underworld, she tells him they can use the Library’s dragon, the Bookwyrm. Unfortunately, the Bookwyrm is too small small to send a human, they send books to and from the Underworld Library. Luckily, Penny can become a book now. If they get Penny to the Underworld in the form of a book, and he finds the key, and he is able to send it back, they still have no way of getting to the Library satellite book depository, which is on another planet, apparently. Poppy says she only knew one traveler, and she was taken by the Beast... Victoria, the traveler who found Fillory and took the third year class there before the Beast cut their vacation short. Quentin tells Poppy that they rescued her from Fillory, and Poppy says she can find her on Earth. Victoria is none too thrilled to see Poppy, her former best friend who slept with Josh Hoberman while he and Victoria were dating, and slams the door shut on them. Quentin tries to convince her that they need her help, and gives her the Truth Key so she can see Penny, the person who telepathically heard her cries for help and traveled to rescue her. She is less hostile once she sees him, but says she can’t help even if she wanted to, as she is now part of a collective and I guess doesn’t get to make decisions. The collective is, of course, headed by Harriet, who doesn’t like Penny, but does like Kady. To get Harriet’s help, they need to talk to Kady, who was last seen in an institution because her insurance didn’t cover normal rehab. Things went further downhill for her when she freaked out at Penny, whom no one else could see, and she is now locked up, proper. Penny, Quentin and Poppy form a plan to break her out, which only goes about half right. They get her out, assault some wholly innocent hospital staff, and have a meeting with Harriet the awful. Harriet may like Kady, but she already did her a favor she was never repaid for and isn’t feeling especially generous. Kady makes an offer in sign language, roping Quentin and Poppy into another terrible idea. It seems Harriet still wants to raid the Library and distribute magic freely, and this is the price for her help in retrieving the key. Margo, Elliot, Fen and Fray; the Faerie Queen. Elliot and Margo stow their stolen faerie eggs in a sack and meet up with Quentin and Poppy in the woods in Fillory. With Elliot’s Key (#1) they open a door to Earth, where Elliot is reunited with Fen and Fray, just back from their excursion to NYC. Fen was delighted by the Square of Time and the bards on Broadway, whereas Fray was confused that the performers in Cats were just people in makeup. They returned to Earth to hide the Faerie Queen’s eggs so they could use them to extort a new bargain. Margo wants the Faerie Queen’s bathtub. More specifically, she wants the Faeirie Queen to trade her bathtub to the entire population of Fillory, which would make the faeries visible to everyone, and give the people an explanation for their rulers’ strange behavior. Back on Earth, Fray finds the Faerie eggs and is horrified that her parents would kidnap and threaten babies. Fen does her best to calm Fray, but she runs away and tells the Faerie Queen where the eggs are. The Faerie Queen, unable to reach Earth, tries to alter the deal into an echange of children. The return of her eggs for the life of Fray. Fray, heartbroken that her loyalty to the Faerie Queen was treated as typical human duplicity against her parents, admits that she isn’t Elliot and Fen’s daughter before the Faerie Queen silences her. The Faerie queen is forced to reveal that Fen’s daughter died in childbirth, Fen is crushed, and Margo presses the original deal now that the Faerie Queen’s leverage is gone. The deal is made, and all the people of Fillory will be able to see the Faeries and know their rulers aren’t crazy. Margo tells Tick to cover for her and Elliot’s absence by saying they have a contagious disease, like chicken pox. They return to find the throne room covered in feathers, which successfully convinced both the faeries and the floaters of the ruse. Great job, Tick! Margo threatens to boil and paint the Faeries eggs like its Easter, the Faerie Queen does not know what that is. Mentioned in the recap portion, Fray’s confusion as to why the performers in Cats were just people, loved it. Fen’s delight that her meal was served, get this, “family style!” I could watch Fen and Fray on Earth all day. Something would eventually crack Fray’s tough exterior. Irene, Victoria, and Harriet need to get their heads out of their asses. I really can’t abide the attitude any of them were giving to the questing crew. Irene extorts Julia for a favor to be determined later- Julia should have told her to go to hell. While Irene’s magic cocaine faerie dust is in limited supply, she knows damn well Julia and the others are the only chance she has at restoring unlimited magic, so give with the dust. Pretty much the same argument for Harriet. Harriet is supposedly some kind of magic-for-the-masses activist, but there’s no magic without Quentin and Penny’s plan. Also, it was her naked ambition that got Penny killed, she owes him a lot more than Kady and Penny owe her. Victoria, you were captured and tortured by the beast until Penny heard you and came to save you, and I’m pretty sure Quentin was instrumental in that too. You owe him much, much more than what they are asking. I really hope we get somewhere definitive with this plot soon. She is really mean and secretive, but keeps hinting at less-than-evil motivations. I do not expect faeries to be forthcoming, but we should have some idea of what’s going on by now. She wanted Margo to marry into the Floaters to gain 4000 soldiers, but her mushroom fields must contain hundreds of thousands of faeries. Maybe they take longer to grow and the 4000 soldiers are ready now. But the Floaters now believe that the marriage into Fillorian royalty makes Fillory theirs to plunder... which makes no sense at all, and gets a few floaters mounted on pikes. Margo did say that the only thing she ever heard about them was that they occasionally raid Fillory, but it makes less sense to raid lands that are now ostensibly yours. In the carriage ride at the end, the Faerie Queen accuses Margo of being typically human, self absorbed and stupid, and that she can no longer help them. I am fairly sure the Faerie Queen’s machinations were in preparation for a greater threat to come, and humans are probably not her first choice in allies, but a little communication would go a long way. To be fair, the same can be said of Margo and Elliot, but they are reacting, poorly, to the pressures put on them by the faeries. Once they got the Queen talking(She admitted Fray wasn’t theirs, she told the truth about Fen’s stillbirth), a few simple questions could have prevented a lot of headaches. I’m reminded of the fairies of the Dresden Files, which I gather borrow heavily from older traditions I am not familiar with- they literally are unable to tell the truth or speak plainly. Julia admits to Alice that she still sees Reynard, something she hasn’t told anyone. Alice asks if it’s magical, but Julia says it’s because it happened. I like that approach to the trauma, and that Julia can admit it to herself. Poppy is a real piece of work most of the time, but I love how quick she was to start a fire in the psych hospital. The security lockdown was blaring for less than two seconds when she grabbed some pamphlets and walked off to turn an all-locked doors situation into an all-open doors one. Once again, I have to feel bad for the staff at the hospital, who really do seem to be doing their best and just get their asses- or balls- kicked for it. I knew Penny would have a tough time finding his way to the underworld, but I never would have guessed turning into a book and being eaten by a pygmy dragon would be his way there. I really hope Fen and Fray will be okay. Fen’s heart is shattered, having lost her baby, regained her as a bratty teen, made the best of that situation only to learn Fray isn’t hers and her real daughter died at birth- it’s been a rough road for the knifemaker’s daughter, and sharpening knives isn’t helping like it used to. Elliot wasn’t the best husband, but his bond with Fen and Fray grew into something real. 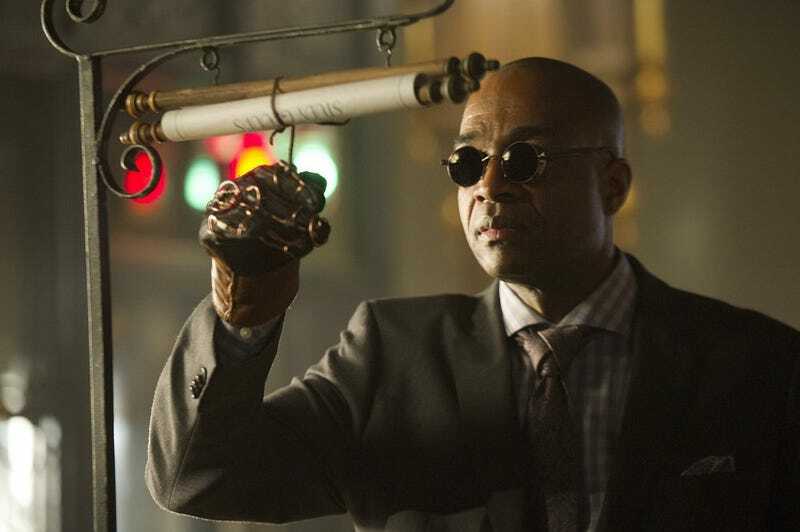 Rick Worthy continues to steal the spotlight in any scene he’s in. Short tempered Dean Fogg is awesome, and he was never that patient in the first place. Knowing now that his limited patience was magically reinforced sheds new light on his earlier performances. Dean Fogg nearly jumped when he found out Irene’s magical reserves were not in the form of batteries, and he’s angry she bought the school without warning him. I hope we get to see him take a more active role in investigating the McAllistair family’s actions. Things are pretty bad all around right now, but the Time Key(#3) has yet to be put into play since Margo dug it up from Jane Chatwin’s grave. They haven’t done anything with it since they got it, so we don’t know the true extent of its power. It was Jane Chatwin’s pocketwatch, not the Key, that reset time, but the Key powered it. Maybe Margo should have rifled Jane’s corpse to look for the watch, too. Or maybe she shouldn’t have been buried with such important items in the first place. The question is, who has it? Elliot and Margo, dragged off in different directions by the angry mob, aren’t in any position to use it, if it is even on them instead of at the Castle, or on Earth. Some kind of time shenanigans may be required to fix some of this mess. The show already pulled from that well in season 1, saving the gang from slaughter at the Beast’s six-fingered hands, but I’m at a loss for how any of this is going to work out with pretty much everyone screwed and scattered.